The most efficient way to load and unload add-ins is with Excel's Add-Ins dialog box, which you access by choosing Tools ^ Add-Ins. This command displays the Add-Ins dialog box, as shown in Figure 21-1. The list box contains the names of all add-ins that Excel knows about, and check marks identify add-ins that are open. You can open and close add-ins from this dialog box by clearing or marking the check boxes. Figure 21-1: The Add-Ins dialog box. Beginning with Excel 2002, the Add-Ins dialog box features a new button: Automation. Use this button to install a COM add-in. Although Excel 2000 supports COM add-ins, it doesn't provide a direct way to install them. Opening an add-in with the File^ Open command opens the file, but the add-in is not officially installed. When you open an add-in, you might or might not notice anything different about Excel. 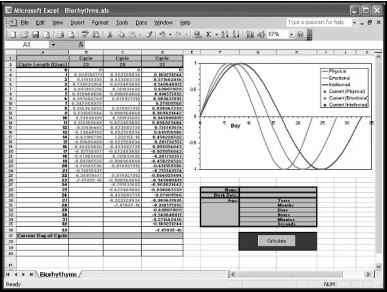 In almost every case, however, the user interface changes in some way: Excel displays either a new menu, one or more new menu items on an existing menu, or a toolbar. 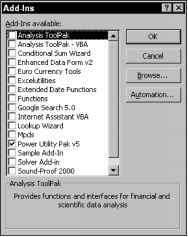 For example, when you open the Analysis ToolPak add-in, this add-in gives you a new menu item on the Tools menu: Data Analysis. When you open Excel's Euro Currency Tools add-in, you'll get a new toolbar named EuroValue. If the add-in contains only custom worksheet functions, the new functions appear in the Insert Function dialog box.